A little bit of what you enjoy is good for the soul, and who doesn’t like a chocolate biscuit? But if you’re on a diet, choccy biscuits are probably off the menu. But here’s a chocolate biscuit you can enjoy without the slightest trace of guilt. 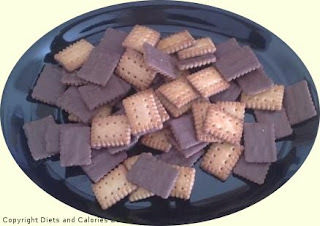 With just 10 calories per biscuit, Sainsbury’s Mini Milk Chocolate Butter Biscuits can easily be included in most calorie counted diets. OK, so they are tiny. Each 110g bag holds 55 mini crunchy biscuits with each one measuring 3cm x 2cm (1.25” x 0.5”). The pack isn’t resealable, so it’s probably a good idea to arm yourself with one of those food clips when you open them. This helps keep them fresh and might just slow down the temptation to keep on dipping your hand in the packet. 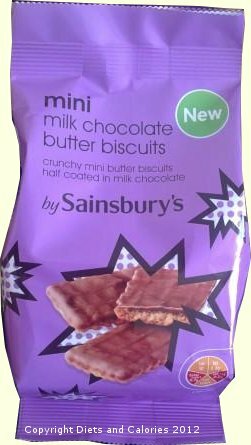 These very buttery, crisp and totally delicious mini chocolate butter biscuits are available in Sainsbury’s supermarkets. Nutrition Information per biscuit: 10 calories, 0.4g fat, 0.2g saturates, 0.7g sugars, trace salt. Suitable for vegetarians.